Greetings, lovely Ascended! Valentine’s here and we've never felt so dreamy before. Do you remember your last hefty romance? A romance as hefty as a storm, rough, but gentle every time the breeze touches you? A romance as hefty as a falling meteorite, crushing every fiber of your bones, but making you so hot you get high? A romance as hefty as a heavy earthquake, shaking your innermost parts so much you’ll spill your guts, but making your heart pound to that beat? A romance as hefty as a volcanic ash rain, poisoning, but soiling the ground you stand on so you could grow a pretty and vivid flower? You do? Great! Tell us, we haven’t finished dreaming yet.So, what do you have to do and how to participate? Think of your most valuable romantic memory in-game and post a screenshot of it here, as well as a nice heart-wrenching story connected to it! 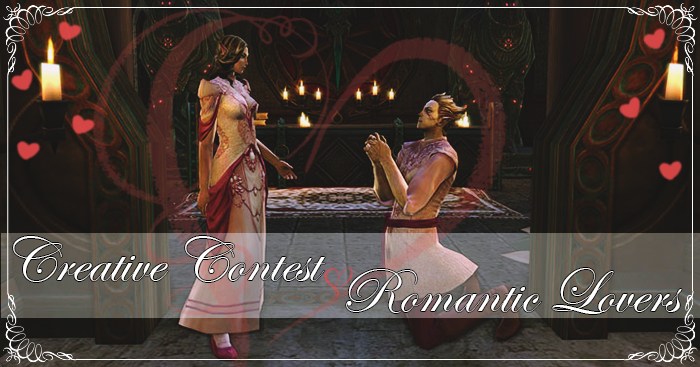 The contest is open to both NA and EU. Send in the screenshot and the story connected to them until the 7th of March, starting today! The rewards will be send as soon as possible after the event is over. Prizes The three best heart-wrenching memories will get some dreamy rewards: a custom title, patron time, credits and loyalty.